Looking for the perfect gift? Everyone loves Robots! 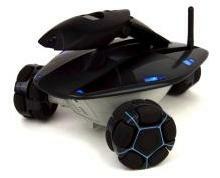 Today's blog entry concerns the iRobot Roomba 4100/4300 Intelligent Floorvac Robotic Vacuum . This robotic vacuum cleaner had a whopping 141 user reviews on Amazon at the time this analysis was done. [11-12-2007] Editor's note: If you read the comments you will see complaints from people that have owned their Roombas for quite some time. This can happen even with a product that gets favorable customer reviews when there are millions of units in the field. The best to solution is to get the Roomba from a vendor with an extended warranty plan. Hammacher Schlemmer offers the Roomba with a free product lifetime guarantee, approximately 9 years on consumer electronics like the Roomba robot. Before I get into the details of the Amazon reviews, which are written by people that have purchased and own the product, a few brief comments. The reviews of the Roomba were overwhelmingly positive, as you will see from the statistics. However, it definitely was a love/hate relationship. The bad reviews weren't a broad spectrum of scores, but instead tended to to be mostly 1 star ratings. What was also notable was a big patch of bad reviews that happened around January 2006. This could be due to a bad production run which does happen on occassion with high tech electronic items like robots. Most of the complaints from bad reviewers had to do with people that had difficult to clean spaces; obviously a human is still going to do a better job here. The other complaints had to do with units that broke early and some people had trouble getting spare parts. But that was a very small percentage of the reviews. Most people were absolutely delighted with the unit and were amazed at how much dirt it picked up; even difficult to handle dirt like cat hairs. Overall the iRoomba received a 4.01 stars rating across all the user reviews. There were 106 good ratings and 28 bad ratings. Out of 401 total votes, 58% of the people that read the bad reviews felt they were helpful. Out of 1263 total votes, 96% of the people that read the good reviews felt they were helpful. If you filter out the reviews that most people felt were unhelpful, including those reviews that people didn’t even bother to vote on or only got a tiny fraction of the votes, the Roomba's rating rises to a 4.89 star rating. Oddly enough, despite the popularity and techno-geek coolness of the product, there weren't any top ranked reviewers that reviewed this product. The reviewers that used their real names made up 54% of the total reviewer pool. There were 57 good ratings in this category and 16 bad ones. They gave the iRoomba an average rating of 4.01 stars. Out of 175 total votes, 68% of the people that read the bad reviews felt they were helpful. Out of 937 total votes, 96% of the people that read the good reviews felt they were helpful. If you filter out the reviews that most people felt were unhelpful, including those reviews that people didn’t even bother to vote on or only got a tiny fraction of the votes, the Roomba's rating rises to a 4.92 star rating. Another oddity. Usually there at least some reviewers that choose to remain anonymous. Not so with the Roomba. There was only one review done by a kid and they loved it giving it a 5 star rating. "I LOVE the iRobot Roomba!" "I was AMAZED at the amount of dirt it picked up, when the floor didn't seem dirty." "I'm amazed at how well it picks up cat hair." "He has a big dirt chamber so he doesn't fill up as quickly, has very sturdy wheels, automatically figures out how big a room is, has a spot clean mode, and a side brush." "I love my new Roomba!" "Fred goes to work every morning after the dogs go out and does an incredible job of picking it all up in our 2500 square foot upstairs." "If I have to babysit the Roomba then it isn't worth it." "(a big disappointment) i read 'roomba review' and thought it could be a great help."